Bio-Oxygen is the natural way to safely eliminate odours and purify the air we breathe. At Bio-Oxygen, we are pioneers in the field of sustainable odour control and air sterilisation systems, with almost four decades of years of achievement in the industry. Our unique system was invented in 1987 by Australian scientist Philipp Leicher, who discovered the potential of paramagnetic oxygen as an eco-friendly and non-toxic solution for eliminating airborne odour, gases and chemicals. We offer the only sustainable and safe air sterilisation system which guarantees odour-free results and 99% elimination of viruses, bacteria, fungi, yeast, mould, mildew and protozoa in as little as 15 seconds. Our indoor air pollution treatment systems are sustainable, effective, compact, low maintenance, have low running costs and come with a lifetime warranty. Headquartered in Australia, all our equipment is manufactured at our local factory for worldwide distribution via our regional operations in five continents. We design, size, install, support and maintain our air sterilisation systems for commercial applications ranging from hospitals to restaurants, and factories to sewage treatment plants. Alternative air pollution solutions exist, but they can be harmful to the environment and to our health. They typically have short product lifespans and require high consumables making them expensive to run. The most common air treatment systems involve the use of carbon filters, chemical scrubbers and ozone. Carbon filters work by trapping air particles to absorb odours, but these particles eventually block the pinholes in carbon and filters must then be removed, washed and replaced. Using a carbon filter system also requires dehumidifiers, which consume excess power. By contrast, Bio-Oxygen consumes just 250 watts. Chemical scrubbers are also commonly used, often in sewage treatment. These consume huge volumes of chemicals, emit fumes and produce toxic waste water which must then be treated and disposed of at a liquid waste facility. Another potentially harmful method of indoor air pollution treatment, often used in kitchen extraction, is the use of ozone. While public health standards exist and the concentration of ozone is regulated to ensure safety, at safe concentrations ozone is simply unable to effectively remove biological contaminants. By contrast, Bio-Oxygen works by using the oxygen naturally present in our air. It does not release toxic gases into the environment, compromising our health. The process does not require perfumes, disinfectants, chemicals or catalysts, nor does it incorporate a carbon filter. And yet, it is extremely effective in removing pollutants from the air. All our systems require is clean, ambient air. In fact, the Bio-Oxygen process emulates nature’s own air purification system: When our sun rises, it releases a cloud of electrons onto the earth. These electrons magnetise the oxygen gas in the atmosphere, creating active oxygen molecules that kill viruses and bacteria in the air. 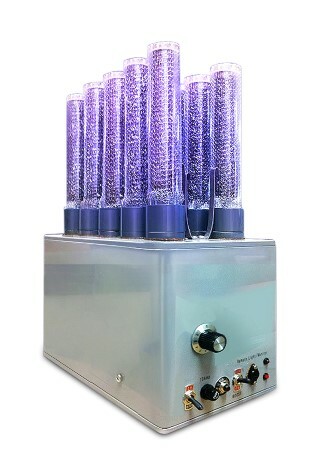 The Bio-Oxygen system replicates this process, in effect behaving as a “mini sun”. To arrange a demonstration by one of our friendly reps and experience the Bio-Oxygen difference, please contact your local office today. Bio-Oxygen enjoys a position at the top of the international air sterilisation and purification market. Many business rely on us to provide clean air for hundreds and thousands of people. From hospitals, to clubs, to high rise buildings, water treatment plants and abattoirs, Bio-Oxygen is at the forefront of new technology to turn dirty air into clean air using our patented technology. With a modern and sophisticated approach to air purification and sterilisation. Bio-Oxygen provide a vital service to tens of thousands of people worldwide who rely on our technology to prevent bacteria and disease from infiltrating the air flow systems. We can customise an air purification and air sterilisation solution to suit your needs. Our air systems can clean and sterilise your air in about 15 seconds. Bio-Oxygen have locations all around the world, that means that we have one local to you. Read about us to learn more about how we can assist you with your air purification and rasterisation needs. Contact us to find the Bio-Oxygen office in your country. This page also has a list of our worldwide locations, so you can contact the office closest to you directly.